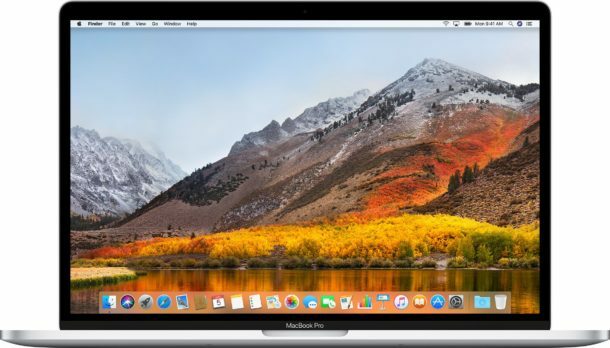 Apple has released the second beta build of macOS High Sierra 10.13.4 to Mac users participating in the beta testing program. The new beta build of macOS High Sierra presumably focuses on bug fixes and feature enhancements, though there are a few notable changes to the end user as well. For example, macOS 10.13.4 beta includes support for iMessages in iCloud, a feature which is also included in the iOS 11.3 beta that aims to improve iMessage syncing. Additionally, the default iMac Pro blue liquid cloud wallpaper is included for all users. Apparently the “iBooks” app has been renamed as “Books” as well, putting that in line with the current iOS 11.3 betas. macOS 10.13.4 beta also includes warnings when launching 32-bit applications, making it clear that Apple intends to eventually not support 32-bit apps in Mac OS. The warning is an indicator to the end user that they must either update the app to a newer 64-bit version, contact the developer to request a 64-bit version, or find an alternative application. Eventually this may lead to some compatibility issues with older Mac apps and newer Mac system software, similar to how PPC apps eventually stopped running on Intel architecture. Mac users enrolled in the beta testing program for Mac OS can find macOS High Sierra 10.13.4 beta 2 available to download now from the Updates section of the Mac App Store. Separately, Apple also released iOS 11.3 beta 2 for iPhone and iPad users who are iOS beta testers. As of the morning of 2/8/18 there is no beta 2 available to beta testers. I believe your info is incorrect. Same here. 2/8 @ 9:30a Pacific. Not showing up in App update like other betas. Is there another place to grab it?